The Timmins North or Tully deposit has a known length of over 600 meters and remains open in all directions, strikes in an east-west direction and dips steeply to the north. The deposit has not been fully delineated, and has now been drill tested to depths of 500 meters below surface. The deposit is hosted by a series of quartz vein and alteration lenses within a mafic volcanic tuff unit that lies between ultramafic rocks to the south and sediments to the north. 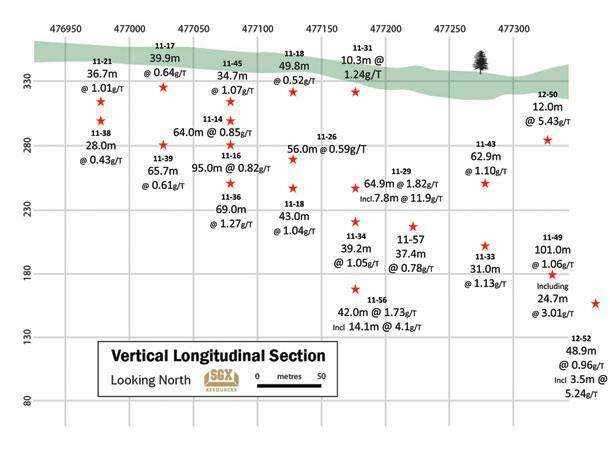 Two diamond drill rigs are currently drilling in and around the Timmins North or Tully deposit with over 100 drill holes representing approximately 30,000 meters of drilling having been completed by SGX to date. This property is located within the Tully Township, east of the Kidd Creek mine and immediately to the north of Timmins, ON.